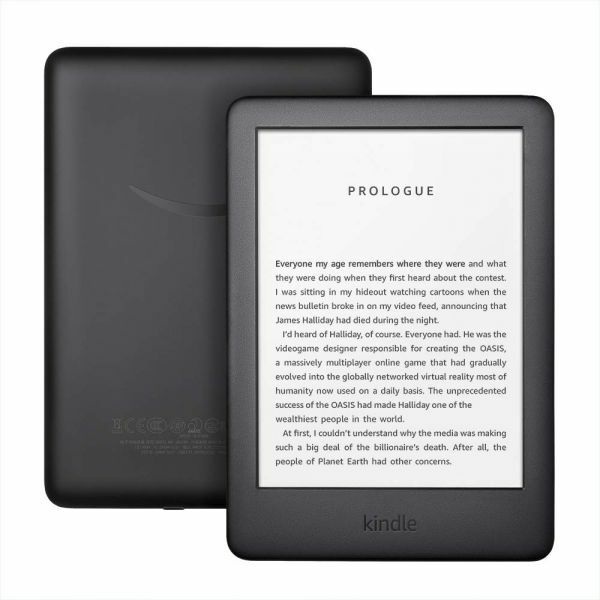 Use your existing Souq.com login credentials to sign-in to your Kindle e-reader and purchase eBooks from Kindle Store on Amazon.com. Amazon.com accepts a variety of payment options, including credit and debit cards. Read distraction-free. Highlight passages, look up definitions, translate words, and adjust text size—without ever leaving the page. Select from over 1 million books including new releases, bestsellers, and thousands of Arabic titles. Meet the All-new Kindle, now with a built-in adjustable front light so you can read indoors and outdoors and at more times of the day. Purpose-built for reading, All-new Kindle features a glare-free touchscreen display that reads like real paper, even in direct sunlight. Amazon's 6” display with built-in light, 167ppi, optimized font technology, 16-level gray scale. 6.3” x 4.5” x 0.34” ( 160 x 113 x 8.7 mm). 6.1 oz (174 g). Actual size and weight may vary by configuration and manufacturing process. 4 GB; holds thousands of books. A single charge lasts up to four (4) weeks, based on a half hour of reading per day with wireless off and the light setting at 13. Battery life will vary based on light settings, wireless usage. Audible audiobook streaming over Bluetooth will reduce battery life. Fully charges in approximately 4 hours from a 5W USB power adapter or computer via USB cable. Supports public and private Wi-Fi networks or hotspots that use 802.11b/g/n standards with support for WEP, WPA, and WPA2 security using password authentication or Wi-Fi Protected Setup (WPS). VoiceView screen reader, available over Bluetooth audio, provides spoken feedback allowing you to navigate your device and read books with text-to-speech (available in English only). Kindle also includes the ability to adjust font size, font face, line spacing and margins. Quick Start Guide; Kindle User Guide. Additional information in multiple languages available online. All-new Kindle 10th Generation - 2019 release. We recommend visiting Amazon.com’s Device Support page, for any troubleshooting help. If your problem still exists or there are issues related to warranty, feel free to call our toll-free Customer Care Service at (+971)-4-437 0900 for UAE. For the terms of warranty for Kindle devices, please refer here for UAE.